Over the course of my career, I’ve seen many small business owners hesitant to embrace public relations and marketing. They are curious about how it can benefit their business, but remain stuck in the same place they were at one year ago. I get it. Change is scary – even positive change. Perhaps business is going fine and you’re not sure you need PR/marketing. Or maybe business is suffering and you’re hesitant to invest any funds in PR/marketing for fear of losing more money. Those are all valid fears. But I’m here to tell you that it’s time. It’s time to make a change. It’s time to step outside of your comfort zone and put yourself and your business out there. Sure, you could keep going along on the same course for the next few years, and maybe even make a small profit doing it. But you’re holding yourself back from the chance to grow your business in a way you never imagined. With all the digital tools available to promote your business, it’s difficult to know where to begin and which ones will truly bring you the success you’re looking for. The answer? There is none. What works for one company may not work for another. That’s why it’s important to customize your PR/marketing efforts to meet the needs of your audience. In order to do that, you need to know your audience. Who are they? What matters most to them? What challenges are they facing? And how can you make their lives easier? If you haven't identified your target audience or put a marketing plan into place, then my free, 7-day Accelerate Your Biz email series is for you. It's a step-by-step guide to creating a solid marketing plan that will bring more clients and cash to your business. Chances are your target audience isn’t aware of the services you provide – and if they are, they probably don’t know the full scope. The only way to drive awareness is to put yourself out there – through email, social media, blogging, or all of the above. Don’t try to tackle it all at once - start with a phased approach. Pick one social media platform and go hard. See what works and what doesn’t. Once you’ve found success on that platform, look at expanding your presence elsewhere. When it comes to marketing, you have to walk before you can run. You don’t have the dough. Naturally money is top of mind for many small business owners. But here’s the good news: you don’t have to spend a fortune to invest in marketing. There are many tactics you can implement for free. For example, social media and email marketing are two very effective, free ways to drive publicity. 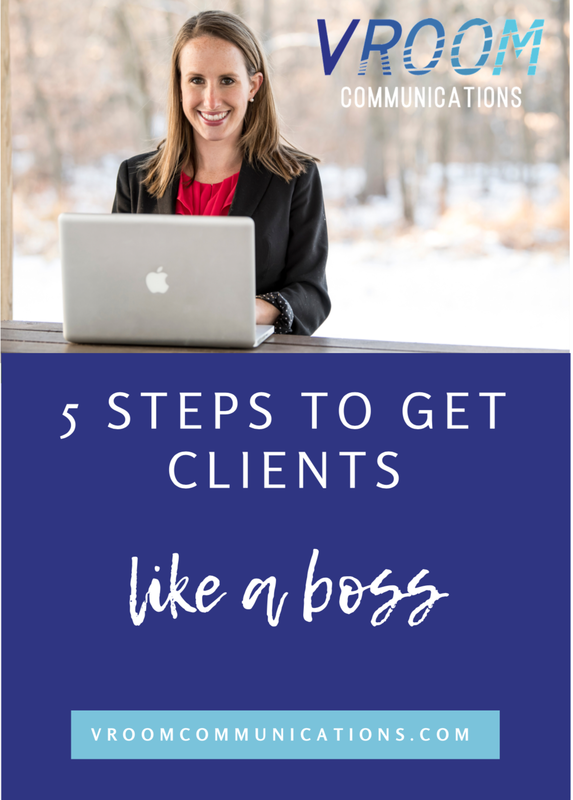 Once you get started and want to take your program to the next level, then consider investing in marketing (when you’re ready, I can talk you through some options). But for now, just start. You want to build your audience before you start spending money. Trust me, there will always be a reason to say you don’t have enough time. But the truth is, we have time for the things that matter most to us. Since your company matters to you, then you’ll definitely want to make time to share it with the world. While investing in a comprehensive PR/marketing campaign does take time, especially upfront, there are things you can do to make your life easier. For example, if you’re starting a company blog, develop an editorial calendar of topics for each month. That way you’re not scrambling to come up with an idea for a post last-minute. Or if you’re posting on social media, schedule posts ahead of time using a free tool like HootSuite or Buffer. I like to pick one day a week where I schedule all my posts for the upcoming week (allowing some flexibility for things that come up suddenly). That way I can spend my week engaging with my audience. If you’re struggling to manage your time, consider getting help. You don’t have to hire if you’re strapped for cash – perhaps an intern from a local college would be interested in helping you out for experience. Just a few hours a month could make a huge difference and free you up to focus on your business. You don’t see the value. PR/marketing are less tangible than other aspects of your business. So they may not be high on your priority list. But here’s the deal: if you’re not on social media and you’re not building an email list, you’re missing out on a huge chunk of your audience. Consumers are wary of businesses. They don’t want to be hit over the head with more advertising. They want to form a relationship with the companies they buy from. And where do they want to do build that relationship? Where they already are, which is online. If you don’t build trust and loyalty with your target audience, then you may as well pack up shop now. You need to have a plan in place that allows you to market your services in a way that is relatable and valuable to the audience you’re trying to reach. That means helping people solve a problem and making their lives easier. If you can achieve both of those things, then your audience (and business) will grow. The first step is communicating with your audience where they already are. Don’t try to sell them on your product/services right away. Just talk to them, relate to them. Your business will thank you for it. If you’re ready to create a marketing plan but aren't sure where to start, then my Accelerate Your Biz email series is for you. You’ll learn the ins and outs of creating a marketing plan – from brainstorming tactics, to budgeting, to implementation, to measuring success. Did I mention it’s free? Sign up for Accelerate Your Biz here. Got questions about how to market your business? Email me at michelle@vroomcommunications.com - I'd love to help!